I’ve had a few inquiries from subscribers recently about power supplies for the RP. The questions generally take the form of “what power supplies can I use with the RP?” The very short answer to this question is: ONLY the one that came with it. A lot of people would like to put their RP into an effect board with a bunch of other devices, and use the power that goes with the board, which is usually 9V or 18V DC. Unfortunately for those folks, the RP150/155/250/255/350/355/500/1000 run on a power supply that puts out 9V AC. If you try to use 9V DC or 18V DC (or anything besides 9V AC, 1.3 amps) with one of those RPs, you will fry the RP. The ONLY RP that runs on a DC power supply is the RP360/360XP, and that’s the one Digitech supplied when you bought one of those devices. Folks, don’t fry your RPs. Use a Digitech-approved power supply for your RP. When you get your RP, label the power supply that came with it so you know that’s the one that goes with your RP. Don’t use that power supply with anything else, except another RP. If you need a backup power supply (which in my opinion is a very good thing to have), order one designed for the RP you’re using. DO NOT attempt to use a power supply designed for the RP360/360XP with any other RP, or vice versa. You will regret it. And by the way, if you live in a place that uses 220V wall power, DO NOT use the US power supply designed for the RP150/155/250/255/350/355/500/1000 without a voltage converter–not just an outlet adapter, a CONVERTER–between the wall outlet and the power supply. Otherwise you will burn out the power supply and the RP the first time you plug it in. I did that in London once, and I’m never doing it again. 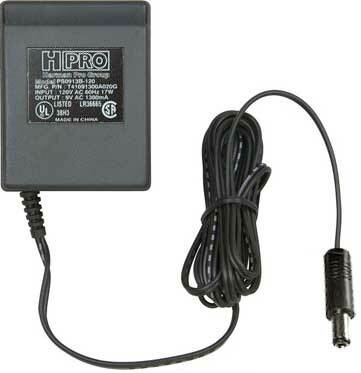 (The power supply for the RP360/360XP WILL run on 220 volts, and it comes with adapters that are designed to work with wall outlet configurations worldwide.) Get the right power supply for your region (or use a battery-powered device like the Zoom G3 loaded with our patch set). Speaking of our patch sets, we recorded every harp track on our new 21st century rock harp record “The Lucky One” with an Audix Fireball V mic and Digitech RP500. Check it out! Digitech RP is 9v AC instead of 9v DC (regular boss/ibanez/mxr power supply). It’s easy tu turn transformer ac/dc adapter to ac/ac adapter. You have to remove any schematics. Polarity doesn’t matter for ac adapters. I think you have confused things here Richard. The RP 355 does accept any 9VAC. The 1.3 you mention is the maximum volt amps output of the Digitech transformer. A 9 VAC transformer which puts out more volt amps is OK too because the Digitech would only draw what it needs. Right, will correct it. Thanks for the catch. I bought a Digitech RP355 in the states. We now live in Spain. I bought the 220 input Digitech adaptor at a music store here. It does not fit the adaptor pin. Took it to an electrical store…they are clueless…went back to the music store, they called in a tech…he is clueless. Any help/advice?? Unfortunately, the stateside one has an input limit of 110…if I plug it into 220 it will fry either the power adaptor, the pedal, or both. It states right on the adaptor that the limit is 110…I have fried enough appliances to be extremely careful about this. Okay, then get a 220V-110V step down transformer, and use that with the 110V transformer. a little bulky, but not extremely expensive. The problem that can only be solved with a US-type transformer is the fit of the plug to the RP. That’s the main issue–adjusting the electricity is easy compared to that. I bought this RP355 a year ayo and now i cant get any sound output through either Amp or Headphones. If I turn on the Drums and crank the RP’s master volume to max I can faintly hear the drum machine (very distant sounding) with headphones on. Guitar leads are all fine when plugged from guitar straight to amp so its not them. I also tried a factory reset but it made no difference. Wendi, the adapter may be the problem. But the adapters are not cheap–a new one is close to $30, as I recall. I suggest you take the RP down to the nearest store that stocks RPs, and try a new adapter there. If you’ve tried using the RP with a non-standard adapter, you may have a bigger problem. The RP runs on AC current–most stompbox footpedals are DC. If you connect a DC power supply to the RP, you can wreck the RP. A factory reset usually clears up the kinds of issues you’ve described. If the factory reset didn’t work, and the power supply isn’t the issue, then I’d send the RP to the nearest Digitech service center–you can find one at Digitech.com. Good luck. Seems like im having the same problem like wendy described i lost my adapter so i plugged it into some adapter i had lying around. IT seems to power on but there is no sound comming out of the input . all i hear is drum, which is very faint as well. I see some adapter on ebay selling for 8 $ or something, Can you let me know if changing the adapter helped. IT seems you need VAC output and VAC INPUT as well. That’s not the power adapter you want. The right adapter has a red ring around the tip. It’s about $25, which is pricey, but not as pricey as a dead RP. Use guitar center or musiciansfriend or something–they’ll have the right adapter in stock. Better to buy one with the right power supply, the USA units only work with 120 Volt AC power. but do the adapter have power range of 110v-220v? ?so I can use in india??? No, it does not have a range up to 220V. If you plug it into a 220V outlet it will fry the adapter and the RP. I have done it. Check with Digitech tech support at digitech.com/support/ to find out what the right adapter is for India. I pluged the adapter in 220v,it works for some 5 sec,it stoped working. and the adapter become little hot.am afraid that my rp got damaged,help plss??? @Akhil: you have probably burned out the power supply and the RP. As per my previous comments, you shouldn’t use the US power supply with 220 volts. is repair the rp is possible? ? any sign that rp survived?? It’s always possible to repair it. is it under warranty? it’s probably dead, so repair or replacement are the only options. maybe you used the adapter that came with it, but if that adapter isn’t designed to work on 220V power then it’s not the right one for you. Contact digitech support for more info at digitec.com/support/. 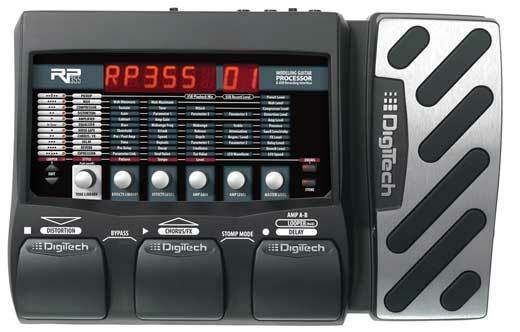 I would like to use Digitech RP155 on the sidewalk! Is there a dedicated battery power supply / stand alone unit similar to Sanyo Pedal Juice (which I use to run all my pedals – Line 6 Tap Tremolo, Wampler , Wah pedals.. Help! @ Desperado: I don’t know of any portable power supply that will work with the RP155, which uses AC power at the device, not just at the outlet. the best bet might be to run something that produces 125V AC, which you can then plug the RP’s power supply into. Otherwise, try a Zoom G3, which runs on battery, instead of the RP155.